Why is the Academy of Nutrition and Dietetics Keeping Mum on Antibiotic Resistance? Last night saw the premiere of a terrific Frontline PBS documentary on antibiotic resistant bacteria in meat as a result of overuse of subtherapeutic antibiotics by the American meat industry. Fun Fact: this morning, POLITICO reported that industry “prepared” for the event by shelling out a large chunk of money to drive web related searches on the issue to their sites. Yesterday, too, OnEarth published a fascinating post detailing how the modern antibiotic crisis started with the same people behind Spam. The post is an excerpt of OnEarth’s editor-at-large Ted Genoways’ new book, The Chain: Farm, Factory, and the Fate of Our Food which we look forward to reading. 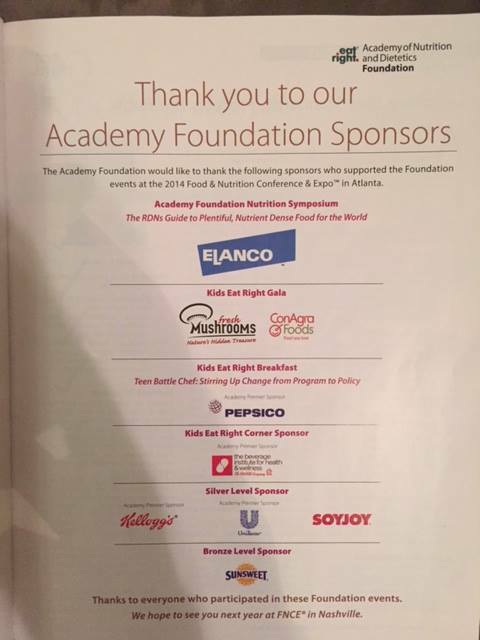 As the photograph you see above (a page in the most recent issue of the Academy’s academic journal) shows, animal global pharmaceutical company Elanco is the sole sponsor of the Academy Foundation Nutrition Symposium, titled “The RDNs [sic] Guide to Plentiful, Nutrient Dense Food for the World.” And, yes, that is PepsiCo you see as the sponsor for the Kids Eat Right breakfast (more on that tomorrow). In case you missed it, DFPI Strategic Director Andy Bellatti detailed the new Elanco-Academy of Nutrition and Dietetics ties in this recent Civil Eats piece. Sad. Another missed opportunity for the Academy to genuinely inform Americans about an issue that has many in the public health nutrition realm legitimately concerned.